Maeve joined b+a architecture charged with enthusiasm. 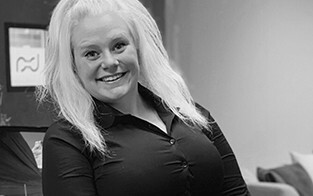 Graduated from the University of Missouri-Kansas City with a degree in Business Finance and a minor in Social Psychology, Maeve is a strong multi-tasker, handling our office and business related tasks. She lives in Waldo with her cat Mr. Kitty. In her spare time, she goes on long car rides, tries new restaurants/bars, and creates mug recipes.